I just came across a remarkable graph on the Oil Drum. 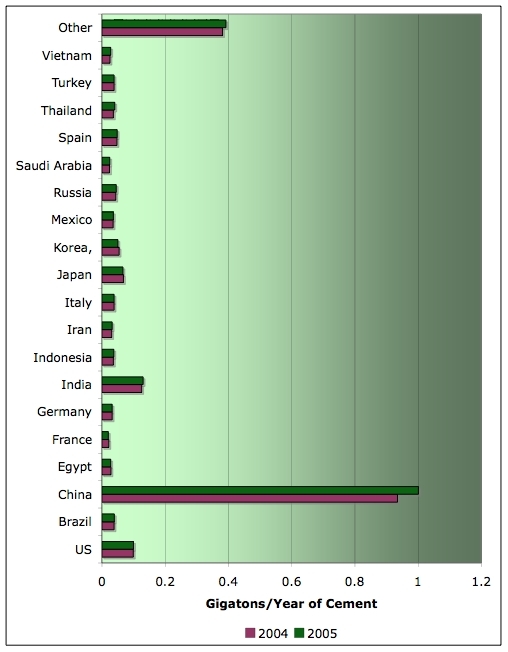 It looks like China is using about as much cement as the rest of the world combined. It's worth plowing through the 100 comments on this post, many of which trace the relationships between cement and energy use, pollution, greenhouse gas production, and destroyed agricultural capacity. China's rate of growth is truly staggering, but that rate cannot continue indefinitely. It will be very, very interesting to see where it all leads (and I mean "interesting" in the same sense that Kevin Somers uses).